Although inconsequential when compared to the horrors that were inflicted elsewhere, the Second World War robbed a whole generation of footballers of the finest years of their career. Those who went to war as young men returned to find that they only had a few years left in their legs and yet they were the lucky ones. Others either didn't return at all or else didn't have the strength to continue playing. Unlike many, however, it was during the war that Ferdinando Valletti played the most important games of his life in a setting that was as distant from the stadia of the Serie A as possible. A defensive midfielder of some promise, he began playing for Hellas Verona, then in the Serie B, when just seventeen before moving to Milan to work as an engineer at the Alfa Romeo factory. There he began playing for Third Division side Seregno where he caught the eye of AC Milan's coaching staff, eventually joining the rossoneri at the start of the 1942-43 season. With them he played alongside a certain Giuseppe Meazza before injuries cut short his season. Despite this, the future for him seemed full of promise. All that changed one night in March 1944 with a knock on his door. Some work colleagues had named him as one of those behind a strike at the factory and that was enough to get Valletti arrested. He was taken to the San Vittorio prison along with twenty two others and, eventually, the Mauthausen concentration camp. There he was put to work in a quarry before being transferred to Gusen, working in constructing underground tunnels. Then, one day, the prisoners were asked if there was anyone good at football because the prison officials need an extra player; it was an incredible piece of luck and one that Valletti did not waste. Despite being severely undernourished, he plays and impresses in the most important game of his life. His reward is a life-saving transfer to work in the camp's kitchens. "Football saved his life," confirms his daughter Manuela Valletti. "It seems surreal that in a concentration camp, while people were dying, the SS played football but that is what happened." "He was asked whether he could play football and put himself forward even though he weighed just 39kg. He was thrown in to play without any shoes on and in his prison slacks. If he hadn't played he would have been killed but he did and won a place on the kitchen staff. There he found a way to help others by passing on some food." The Italian painter Aldo Carpi, another Gusen detainee, name-checked Valletti on a number of occasions in his Gusen Diaries indicating him as one who helped save his life on a number of occasions. Valletti passed away in 2007 and to the end remained reluctant to talk about his experiences. "He never spoke about what happened. I remember that once I went with him to meet some people who now I know where others who were deported from Alfa Romeo. He left me to play in the garden because he didn't want to distress me." "He had a box with all the material that he had collected on Mauthausen which he kept hidden away. I only discovered that shortly before his death." Of those stories that Manuela heard, the one that she enjoyed most was that of her father's return home. "It was the first time we met each other. He had been taken away when my mother was pregnant and returned when I was ten months old. He didn't even know whether he had a son or a daughter. He always told me that as soon as he saw me he started crying with joy. This bond between us remained and we always understood each other." One thing that was never the same upon his return was his ability to play football. "He needed treatment and couldn't play any more. But he got in touch with some of his old teams and even was manager of some Serie C sides." Despite the horrors that he had witnessed, Manuela says that "my father was an optimist, full of energy who always wanted to help others. Even at work at Alfa Romeo (where he returned after the war) he was greatly loved by those who worked for him because he understood their problems and always looked to improve their conditions." It was arguably that optimism that kept him fighting to survive during the war. Not for nothing that when Manuela came to write his life story she titled the book "Deportato I57633: Voglia di Non Morire" (Deported I57633: A Wish to Not Die). "For me it is a duty to talk about it," she says about the reason behind her writing this book. "A lot of those who were deported are now dead and only a few survive till this day. Their children and grand children cannot let the horrors of these extermination camps be forgotten. Till I can I will keep on reminding people in any way that I am allowed to." 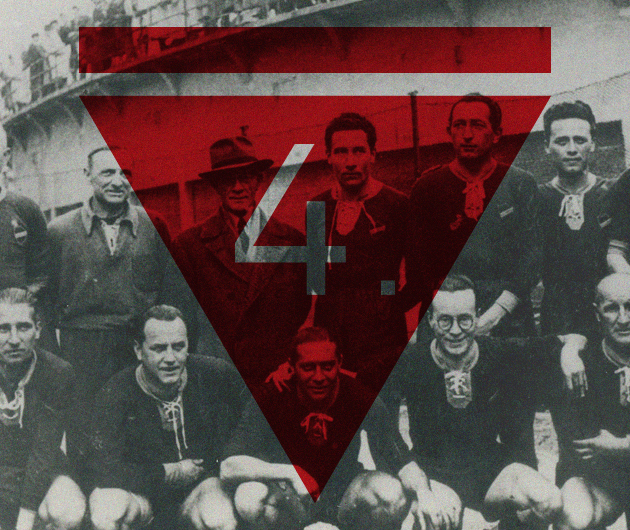 That book also served so that AC Milan realised that Ferdinando Valletti had been on their books and eventually the club's official historian took part in a number of remembrance day ceremonies. Despite this acknowledgement, Manuela would like a little bit more; "I'd love it if Milan could put up a commemorative plaque in his memory at the San Siro Stadium". This article was published on the Spiel Magazine's website on March 29, 2013.